Made with high quality cotton lace, wooden shaft and metal ribs. 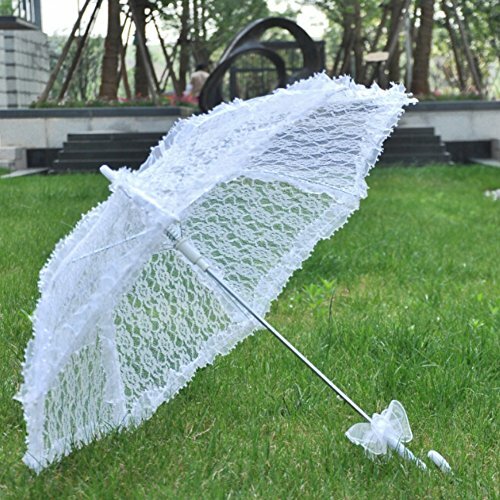 High-quality lace fabrics are selected for the umbrella fabrics, and the solid wood umbrella handles are polished without grinding, which is beneficial to the better grip of the palms. Graceful edge and embroidery pure cotton lace parasol umbrella, make you more charming with this under the sun. Great for wedding bridal party decoration, photo props, gift, dance ball, concert, theater etc. Please do not protect against the rain. With its lovely crafted details, this umbrella goes with any outfit. A Small:26cm, Large: 43cm across when open. 1.Please allow 1-3 cm error due to manual measurement. pls make sure you do not mind before you bid. 2.Due to the difference between different monitors, the picture may not reflect the actual.n different monitors, the picture may not reflect the actual color of the item. 100% Brand-New: Made with high quality cotton lace, wooden shaft and metal ribs. Fancy Style: Graceful edge and embroidery pure cotton lace parasol umbrella, make you more charming with this under the sun. Perfect Decor: Great for wedding bridal party decoration, photo props, gift, dance ball, concert, theater etc. Please do not protect against the rain. About Size: Approx.31.49"(80cm) across when open. View More In Luggage & Travel Gear. If you have any questions about this product by Tracfy, contact us by completing and submitting the form below. If you are looking for a specif part number, please include it with your message. Soft Rose Breathable Wedding Bridal long gown Travel Storage Garment Bag 24"x72"x10"